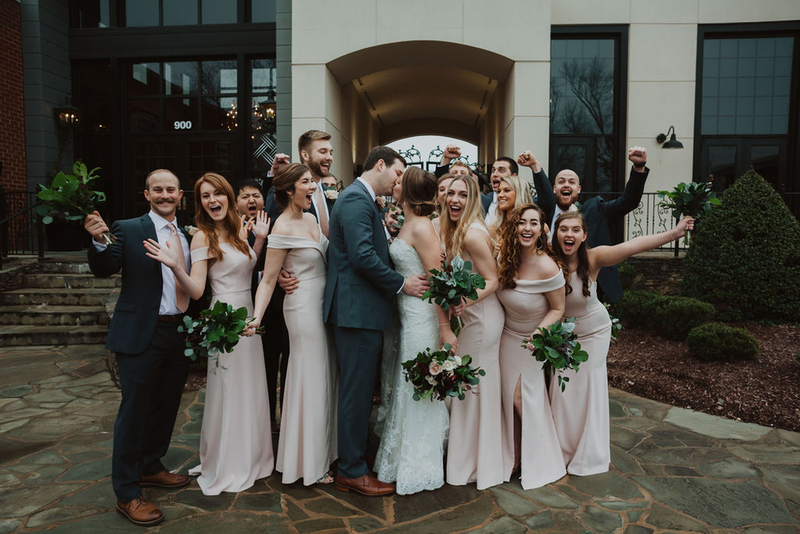 Jon Mark and Elizabeth were married in January 2019 at Westover Church in Greensboro, NC and celebrated their reception with us at The Colonnade at Revolution Mill. The couple met on a blind date and became engaged surrounded by their families at the beach. With Winter in full effect, Elizabeth and Jon Mark chose to use the season as inspiration for their color palette using rich, leafy greens and pale blush pink with gold accents. What did the couple have to say about the planning process? The take-away? Enjoy your wedding day despite the tiny details. It’s YOUR day, make it amazing. While the wedding party wrapped up their photo session, the guests enjoyed refreshments and a cheese display of cheddar, swiss and pepper jack, garnished with red grapes and fresh berries, served with assorted crackers. Dinner began with a classic tossed garden salad. Then guests enjoyed a delicious buffet of grilled chicken breast with Parmesan cream sauce, pulled pork barbeque, creamy coleslaw, fresh green beans and assorted breads. Pepper Moon’s famous smashed potatoes completed the dinner menu. What drew Jon Mark and Elizabeth to The Colonnade for their reception? The couple also loved the floor to ceiling windows, the exposed brick, iron railings and exposed beam ceilings.... Everything! It was an honor to be a part of Elizabeth and Jon Mark’s love story! We can't wait to show you how The Colonnade in Greensboro can be customized for your wedding day! Contact us to chat about it today.